We want you to remain safe when using the internet and mobile phones. It’s always a good idea to make sure a parent, teacher or carer knows when you’re surfing the internet. That way, if you see or are sent anything that makes you feel uncomfortable or upset while you’re online, you can tell them. Please act responsibly and report any content on the web that makes you feel uncomfortable to an adult. 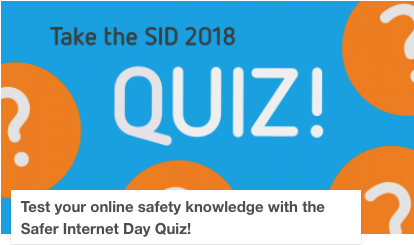 How should I stay safe online? Don’t arrange to meet anyone you’ve met online, no matter how well you think you know them, without your parent or carer’s permission. Meeting someone you’ve only been in touch with online can be dangerous as they may have been lying about who they are. Even if you get permission, make sure you have an adult with you when you meet for the first time. What if I’m asked to register on a website? If a website asks you to register online and you have to fill out an email form, always ask for an adult’s opinion. If you do register, never use your real name as your online screen name or nickname. Very often the website is just trying to sell you something. Do passwords keep you safe? Only if you keep them completely secret – don’t even tell your best friend. And try not to use names of your family or pets, because people can guess them quite easily. Use a mix of letters and numbers instead. Sending and receiving emails between family and friends is usually OK. But don’t open emails, downloads or attachments from people you don’t know or trust as they could contain a computer virus or unwanted messages. The best thing to do is to delete them. What should I do if I get a dodgy email? If you get an email with rude or unpleasant things in it, tell a responsible adult straight away and DON’T REPLY to it! Remember that it’s not your fault someone has sent it to you. Can I block unwanted email? Spam, or unwanted emails, make up half of all emails sent around the world. They are usually meant for adults and can be upsetting for children. But you don’t have to accept it or put up with them. There is special software which can stop spam getting into your inbox. Speak to your parents about the software if you are at all worried. Most internet and email companies, like yahoo, hotmail and AOL, have systems in place to block spam, and they’re working to improve them all the time. If you need more information about what they can do, email them for help. This is using part of a chatroom where other people can’t see what you’re saying. Never agree to a private chat with someone unless you already know them face-to-face, in real life. You can also have private chats on “instant messaging”. Instant messaging – sometimes shortened to IM – is a computer program that allows you to send messages that other users receive straight away. It is best only to do this with people you already know in real life. If you get to a chatroom through instant messaging, remember to follow the same safety rules you would use if you were chatting anywhere else. What about social networking sites? Social networking sites are places where you can keep in touch with friends and let people know what you’re up to. Popular ones include Facebook, Twitter and Instagram. You normally have to be at least 13 to register on them, and even then you often need your parents’ permission. They can be dangerous though because you must be careful not to post personal information about yourself. Also, you must keep your password to yourself, or else people could write nasty things pretending to be you.